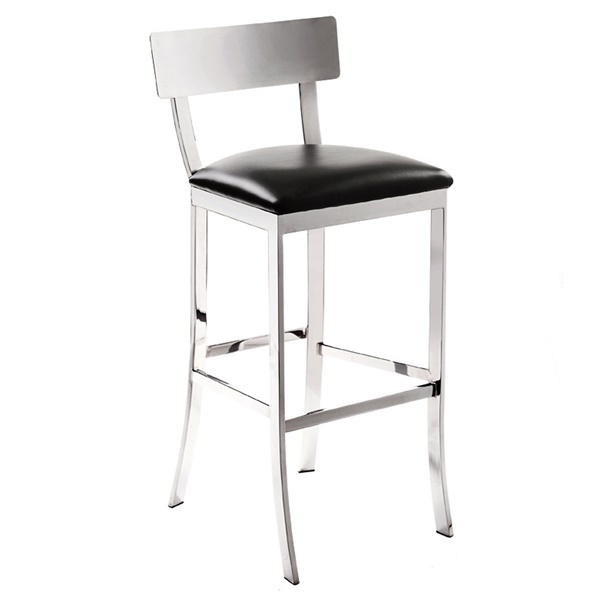 Sleek and glossy top to bottom, that’s the Maiden Bar Stool from Sunpan, a stool that unfailingly adds a sense of sparkle to a bar’s ambiance. This variation on Mid-Century design has a definite European twist, with interestingly detailed stainless steel construction. Angled stretchers join curved strap legs that change their orientation – wide dimension one way in back, the other way in front. Even the backrest bolts have style! The fully-padded upholstery of the Maiden Bar Stool ensures satisfying sit-down comfort, and the smooth, soft faux leather comes in a choice of colors.